So far I have received three LeTote boxes. I have been truly enjoying getting the packages and definitely look forward to each shipment. I am kind of a dork and don't look on my account before it arrives so it's all a surprise! The clothing has fit me pretty well so far. 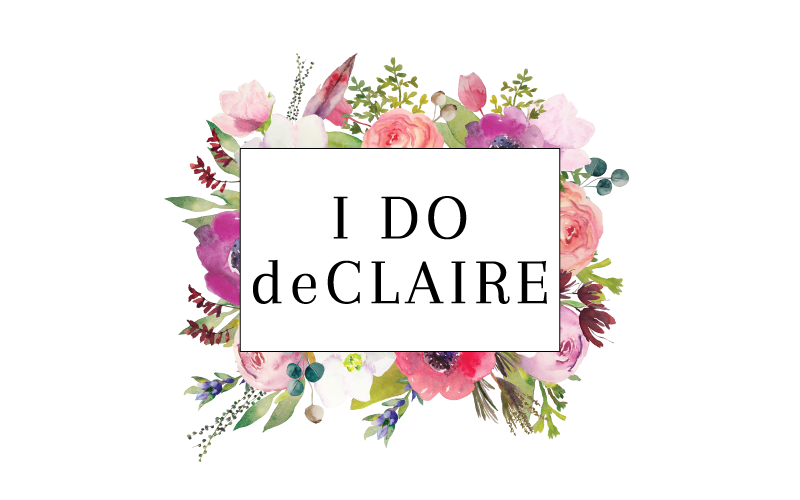 I've had the opportunity to try out hi-low styles, faux leather, and jewelry styles I wouldn't typically buy. My thoughts so far? It's a fun service and I like it. However, I am not sure if it is something I would consistently subscribe to. With my budget I would be more likely to do a month once in a while when I am having trouble deciding if a trend is for me or finding items I like in stores and want to try things out of my box. It would be really nice if LeTote ever decides to do a low cost box that is around $30 for 3 items so it's more affordable for a wider range of people. 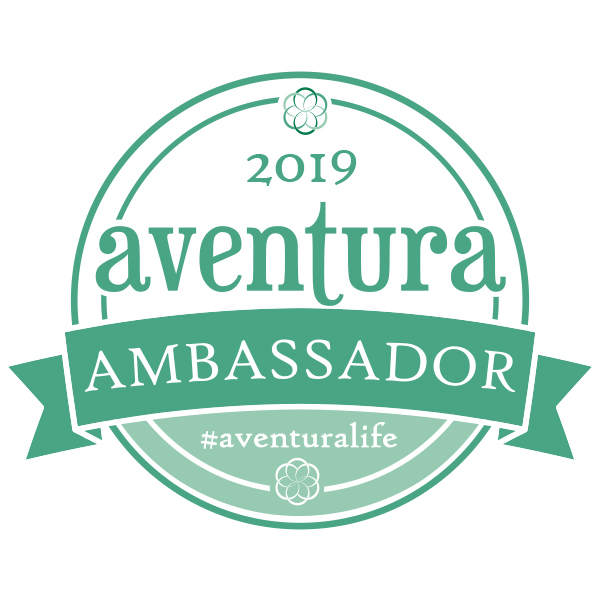 If you want to try it out use my referral link so you can get a $10 purchase credit when you sign up (oh, and I can get a credit, too)! I would be the same way...I love a good surprise! I also agree with you on the pricing. I would be more apt to try it if there were a more affordable option. Yeah, $50 just seems like a lot to rent clothing. Just curious, did you try Golden Tote or Le Tote? It sounds like you tried Golden Tote, where you buy the clothing. Le Tote is a clothing rental service. So if I don't like something I just send the bag back and get a new one in a few days. There is the option to buy the clothing as well. 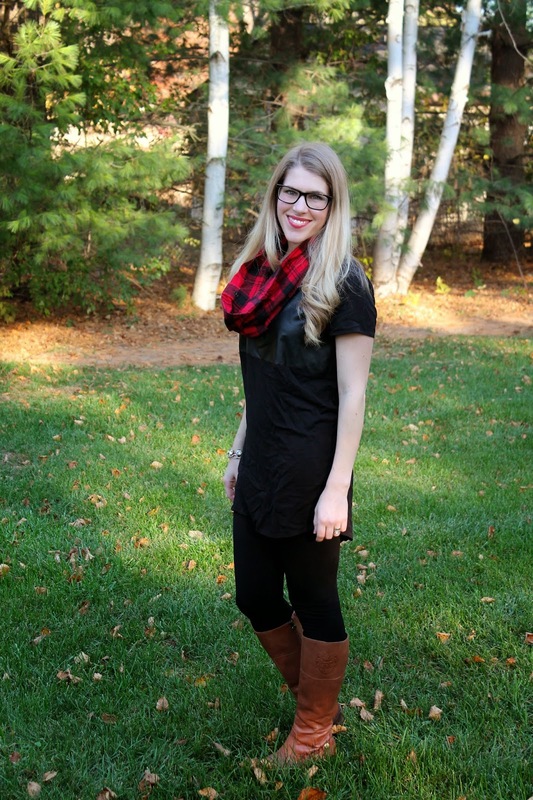 So cute Laura, love the tunic such a versatile top and the pop of red with your plaid scarf is so pretty!! Tempted to try one of these services I haven't yet. Love this top and I am really enjoying Le tote. Haha! They sound so similar! It's good to know about Golden Tote though because I've been tempted to try them before but haven't yet! I would totally want it to be a surprise too. That's so fun. I love the tunic and how you styled it with the tan boots. Black and tan will always be a great combo. I love surprises. I'd do the same thing! this is a great casual look on you especially with the scarf. 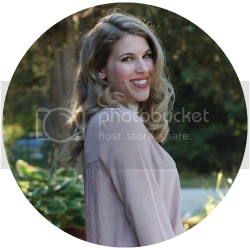 Le Tote is such a cool company, I learned about it from you and Rachelle! This is an adorable look on you--I love the leather and you look so great in those glasses! Love the top here...especially the block of faux leather!! Tunics are the best, espcecially when the have a nice touch such as this! I love that scarf! Great look for fall! I considered trying it a month for free but I was worried it would rope me into buying things i didn't need. You look great today though! I feel the same way about all of the subscription boxes. I like clothes enough to plan out what I want to buy each month, so just getting a bunch of clothes I don't need (even if I like them) doesn't seem like a good fit for me. But, I have heard from a lot of people that struggle with shopping that they LOVE them! Anyway, love the tunic with the scarf! I dont get subscription boxes but order enough online that I get packages in the mail, and it is exciing. 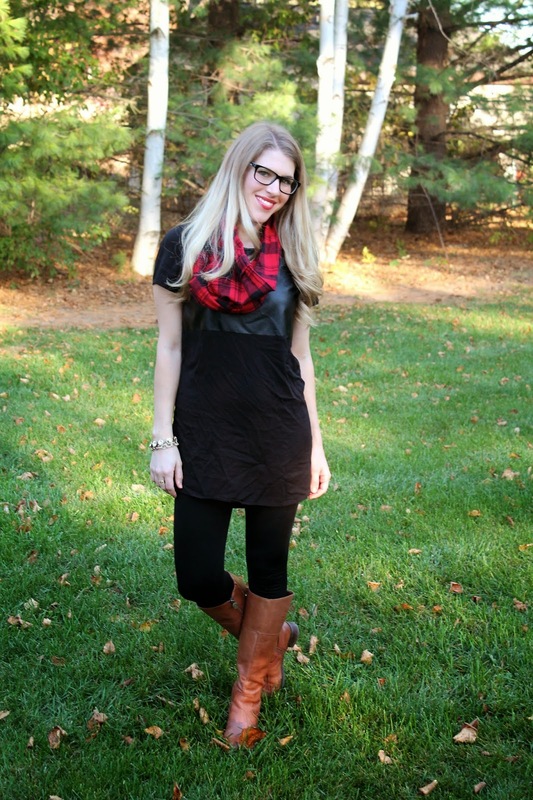 Love the tunic on you, pretty boots and the red is a perfect color on you with the scarf! Oh you're too cute in your glasses!! Love the outfit too, the touch of leather on the top of the dress is great. Love that plaid scarf! It adds just the right amount of pop! We don't have anything like LeTote here in Uk. sounds like a good idea! Love the colour of your scarf and your boots are just perfect. You look so very studious! so dang cute!! love it. With that frame on, you are a college girl again! Lovely look! You're rocking that tunic. Great tunic paired with the buffalo check. I have not joined any subscription clothing sites, I feel economically it just doesn't make sense. Love this look with the buffalo check scarf. I feel exactly the same way as you do about Le Tote! The subscription services are fun, but I agree they seem a bit pricey for clothes you are only renting. What a great fall outfit! I love the leather and scarf together! 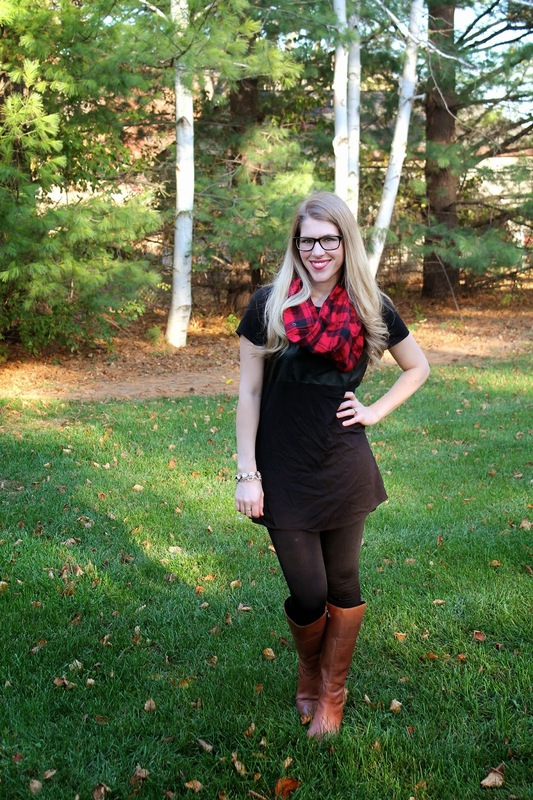 I am really feeling the gorgeous red plaid scarf against the all black. And wow you made that cute scarf! I love the look of a tunic/dress with leggings and boots!! It's one of my go-to weekend outfits :) I really like your new glasses as well, by the way! You look adorable in them.